Right click selected code and select Toggle Breakpoint. Note: the next step will freeze the game and the browser, so open the steps in another different browser or paste it in notepad. Click Open Chest and Click on your Petling. The game/browser will freeze. Right click the selected code and select Toggle Breakpoint. Paste the 'ECX' address you copied earlier and add '+3C' at the end. Go to Pet Society and change room. A pop-up will appear saying your petling has left house. Publish it. 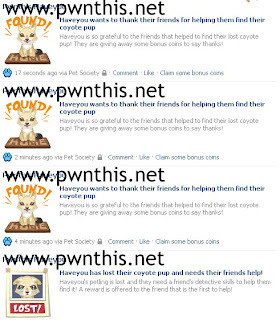 Using another browser (maybe Flock or Chrome) Go to your main account and you should see the notification of your secondary account 'To Find Petling" Click to gain the 200 coins. Change room and a pop-up will appear saying your petling has been found. Publish it also. You can only repeat from step 1 to get more coins.